Offering you a complete choice of products which include printed laminated pouch. We have gained gratitude as an eminent enterprise, devotedly affianced in offering a broad range of Printed Packaging Bags. These packaging bags are manufactured by utilizing best quality material in order to fulfill the customer’s requirements. In addition to this, our quality experts perform a test on these packaging bags by utilizing their immense experience. 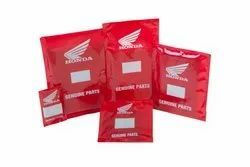 The offer packagings bags are provided in various customize options to facilitating our customer’s diverse requirements. We are offering customized products. Looking for Printed Packaging Bags ?